An exploration of coding accuracy can yield worthwhile riches for organizations seeking to maintain a strong financial foothold. Every healthcare organization is expected to have in place an effective coding compliance program—one that will be continually evaluated and reevaluated. To accurately assess the program’s effectiveness, it’s necessary to measure several outcome indicators, including error rates, which many HIM experts consider to be the most significant. There are various methods of determining chart error rates but, according to Rose Dunn, MBA, RHIA, CPA, FACHE, chief operating officer for healthcare consulting firm First Class Solutions, Inc, the two most common are the “code-over-code” and “record-over-record” methods. In each approach, several charts are selected for review. The code-over-code approach divides the total number of correct codes by the total possible number of correct codes, while the record-over-record approach divides the number of records correctly coded by the total records in the sample. According to the AHIMA publication Benchmarking to Improve Coding Accuracy and Productivity, the more widely recognized record-over-record method provides the advantage of being less labor intensive. On the other hand, it is considered to be more subjective because it may not include a definition of what counts as an error. In addition, some organizations may adjust the error rate based on the perceived impact of the errors. The more specific code-over-code approach is deemed more objective because errors are more clearly defined. According to the AHIMA publication, it is also more effective in identifying trends for educational purposes or process improvement. The disadvantages of code over code are that it takes longer, represents a change in thinking, and requires more of a learning curve for auditors. Lori-Lynne Webb, CPC, COBGC, CCS-P, CCP, CHDA, a coder III at Saint Alphonsus Regional Medical Center in Boise, Idaho, recalls that when she performed staff audits for one particular healthcare provider, she would randomly pull 25 charts per coder twice per year. She used a 100-point scale and would simply deduct a point for an error, such as a missed procedure. The organization set a passing rate of 95 for individual charts but also required coders to achieve a passing rate in 80% of the 25 reviewed charts. Error rates can also reflect the severity of the error involved. There are five levels of care within evaluation and management (E/M) CPT codes, with one being the lowest and five the highest. When Jacqueline Thelian, CPC, CPC-I, a healthcare consultant with Medco Consultants, Inc, performs audits to determine error rates for E/M charts, she separates errors into those requiring a one-level service change and those involving changes greater than one level. What Is an Appropriate Error Rate? There is no one answer when it comes to determining what constitutes an acceptable amount of miscues. Dunn says most facilities attempt to maintain an accuracy rate between 94% and 96%, while Thelian points out that an error rate of 5% or lower is considered acceptable by the Office of Inspector General. Dunn says determining error rates serves several purposes, the most important of which is to identify educational needs for individual coders as well as the entire coding team. During the course of an audit, Webb says if she determines a coder has a problem with E/M codes, she assigns that coder nothing but those codes for several weeks and then reevaluates his or her performance. “So I would expect to see improvement in that time frame because there had been so much concerted education,” she says. • They can help identify coders who are achieving a high level of accuracy, allowing the organization to consider them for advanced positions such as lead coders, supervisors, or internal auditors. • They can be a tool to help base merit/performance pay increases for deserving coders. • They can be part of any coding incentive plan, which should always require a minimum coding quality level before allocating any bonus payments. 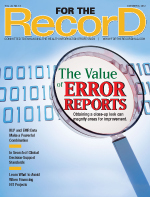 Keeping tabs on error rates can lead to financial implications. While working in an obstetrics and gynecology practice, Stilley perceived the office was purchasing too many intrauterine devices (IUDs). At a cost of $500 to $700 per device, it was an expensive habit. What’s more, Stilley was concerned the practice wasn’t billing for all the IUDs it was purchasing. Sometimes measuring the kind of education necessary for coders can be just as exact as measuring an error rate. Thelian is familiar with one healthcare organization that would assess error rates by assigning a letter grade to the coder, which would then be used to define what kind of education that coder needed. Thelian points out that the Office of Inspector General realizes that document cloning has become a serious problem, warning that Medicare contractors are seeing an increased number of medical records across services with identical documentation. EHRs allow providers to basically point and click their way through bullet points, Thelian says, which invariably leads to duplicative and excessive documentation. “So it appears that you have the documentation to support a level 5 visit, but there’s really no medical necessity for it,” she says. “And if you were to hold the notes up to the light, you would see that they are exactly the same.” These types of errors can lead to being audited, Thelian adds. These HIM experts say whether a provider decides to lean on technology is inconsequential as long as a sturdy compliance program is in place to monitor coding activity. If not, the consequences could be grave.